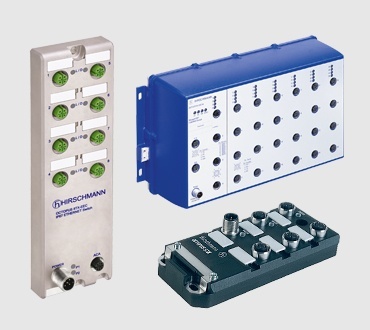 The unmanaged switches in the OCTOPUS family can be used to set up cost-effective connections to Ethernet terminal devices even under the harshest environmental conditions. PoE versions can power terminal devices operating in even the most challenging environments directly via the Ethernet cable, doing away with the need for additional power supply units. Unmanaged Ethernet switches accommodate the need for easy-to-implement solutions in small industrial network applications. Install straight out of the box in areas where space is a premium. Meet application-specific regulations for use in railway vehicles, along railway lines, for fire protection in trains and in road vehicles. Built to withstand demanding conditions (IP67/65 rating), including extreme temperatures, high vibration, water and dust. Increased Network Reliability - Unmanaged OCTOPUS Ethernet switches allow fail-safe networks to be installed in a variety of application scenarios and offer maximum network reliability and long-term availability under extreme conditions. Robust compact housing - These switches have an IP67/65 rating, meet the requirements of switching functions in waterproof and dust-tight housings for mounting outside of cabinets and also operate at temperatures ranging from -40 degrees C to +70 degrees C.
Approved for Transportation Use - Unmanaged OCTOPUS switches meet application-specific regulations, including EN 50155 for operating conditions in railway vehicles, EN 50121-4 for use along railway lines, EN 45545 for fire protection in trains, GL for ships, and e1 for use in road vehicles. Download the white paper "Industrial Wireless Technology for Railway Systems" and learn how wireless industrial Ethernet-based networks will conform to global railway standards.